Redbush tea is a beverage brewed from the dried leaves of the rooibos plant, a low-growing shrub native to South Africa and known scientifically as Aspalathus linearis. The herbal tea gets its name from the English translation of rooibos, which means “red bush” in Afrikaans. Usually made from oxidized -- or fermented -- leaves, the beverage is reddish-brown in color. Touted for its reputed medicinal properties, redbush tea has been the subject of increased research over the last few decades. Researchers at Tokyo’s Juntendo University School of Medicine conducted an animal study to evaluate the antioxidant properties and anti-inflammatory effects of rooibos tea. Seven-week-old laboratory rats were divided into two groups. One group received rooibos tea, while the other got plain water. After four weeks, the researchers tested the animals’ blood to measure levels of superoxide dismutase, or SOD, an enzyme that helps break down potentially harmful oxygen molecules in cells. SOD levels were significantly higher in rats that received rooibos, compared with those that got water. Even after the administration of a chemical agent known to cause colitis in rodents, SOD levels in the rooibos group remained significantly higher than those of the control group. Furthermore, hemoglobin levels in the rooibos group held steady but decreased in the control rats. In the October 2009 issue of “Pediatrics International,” researchers said their findings indicate that rooibos, which contains no caffeine, might be useful in reducing oxidative stress in children. Researchers at South Africa’s Cape Peninsula University of Technology conducted an animal study to evaluate the cardioprotective properties of fermented and unfermented rooibos as well as green tea brewed from the unfermented leaves of the Camellia sinensis plant. Laboratory rats consumed rooibos and green tea extracts for seven weeks, after which the animals’ hearts were excised and placed in a machine that simulates the workings of a real heart so that circulation could be restored. Researchers studied the hearts to assess the effectiveness of these tea extracts in minimizing the damage caused when cardiac circulation's abruptly stopped and then restored. In an article in the November 2011 issue of “Phytomedicine,” researchers reported that the hearts of rats that received rooibos extracts showed significantly less damage than those of rats that got green tea extracts. In an in-vitro study, a team of South African researchers explored the effects of hot water soluble solids from fermented rooibos tea on fat cell formation. Obtained while preparing a cup of fermented tea at ordinary strength, the soluble solids were then introduced into laboratory vessels containing specialized cells designed to store fat to see how or if they affected the fat cell formation process. 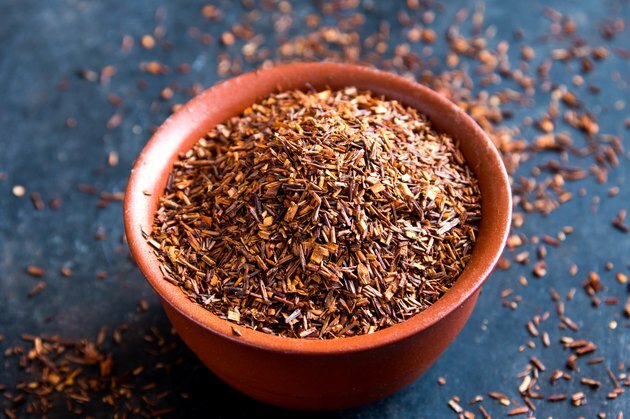 Publishing their findings in a 2013 issue of “Phytomedicine,” researchers reported that the rooibos solids not only inhibited the formation of fat cells but also showed positive effects on the metabolism of fat cells. They said these findings suggest that rooibos may be able to play a role in preventing obesity. What Are the Health Benefits of Mulberry Leaf Tea?